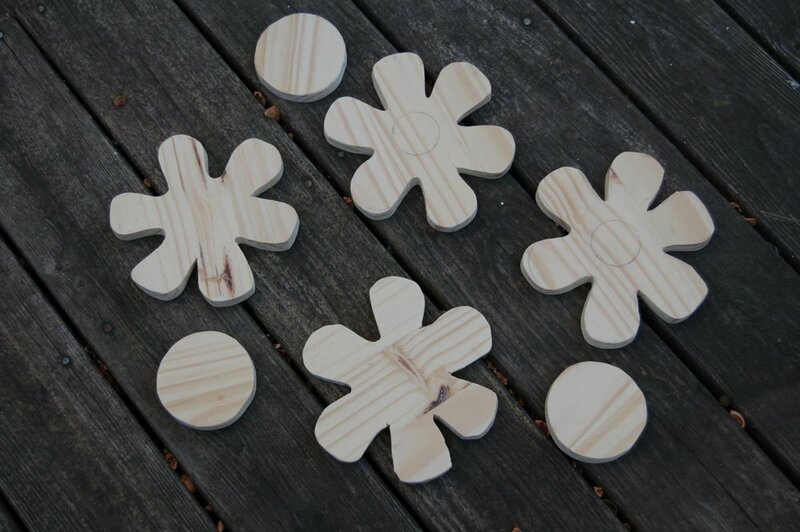 The story of the wooden flowers started with my assignment to design a room for a 5 year old girl. Our focal point was a bed and a high ceiling.When thinking how to cover the space about the headboard, I came to the idea of the canopy that would be suitable for a 5 year old girl. The wooden flowers that would hold tulle fabric were perfect. So I went to work: designing, jigsawing and painting the flowers. Once installed on the wall and draped with the pink tulle fabric I loved the final effect. And so did the little girl. We added fairy decal on the wall, colorful chandelier in the window nook with the custom seat cushions. The window treatments were custom made cornices in purple and white geometric pattern. The furniture was custom painted to match the bed. We continued the flower design on the drawer knob on the nightstand's drawer and added the same wooden flower on the headboard to create a diamond shape of flowers. More pictures of the fairy room are in the Image gallery under Kids' rooms tab. Enjoy!